This bracelet was purchased by my great aunt, probably in the far east on a trip spanning 1918/1919. It is unknown exactly where. I am attempting to identify the maker and the stone material the Foo Dogs are carved out of. Can anyont help? I can't help you with this. 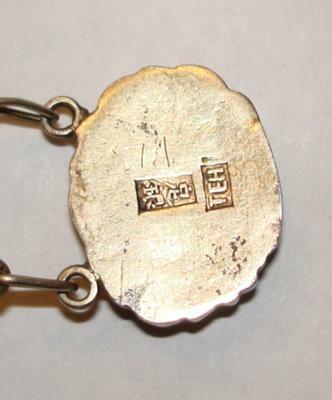 The Chinese characters are just mentioning "deposit silver", the actual mark is probably the TEH.